Lest you think differently, Bloomington has been a hopping town for some years now. And university students today are different in many ways from the students of yore – but similar in so many more. On a spring morning in 1890, Bloomington residents woke to find that a particularly vulgar bogus had been delivered to their doorsteps during the night. The authors accomplished much in its single page, attacking Indiana University students and faculty by calling into question their intellect, morality, and sobriety. Bloomington citizens were outraged, as at many households children found and read the bogus before parents got to it. And the University administration? Well, you can imagine their response. While unhappy about the situation himself, in public President Jordan tried to play the “boys will be boys” card. The IU Board of Trustees, however, was having none of it. They wanted the responsible students punished, so they called in the big guns to find the dastardly authors – none other than Chicago’s Pinkerton National Detective Agency. 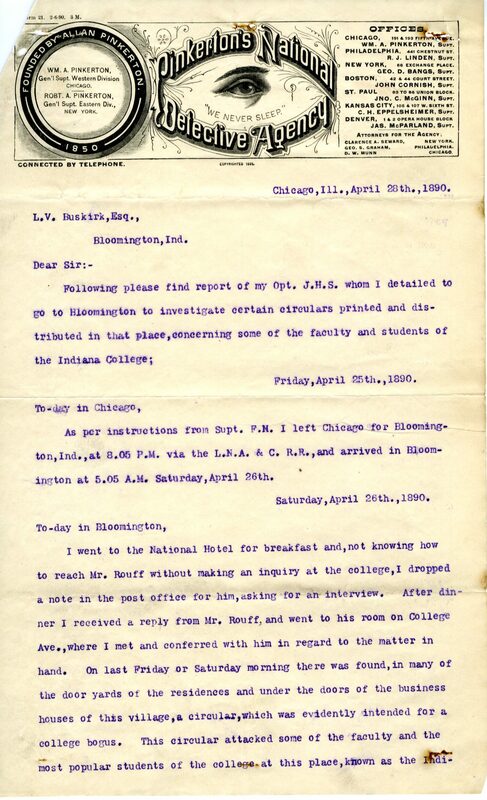 The Pinkerton operative, known to us only as J.H.S., arrived in Bloomington in the wee hours of April 26th, 1890. In the Archives, we have a terrific series of letters the investigator sent to back to headquarters in Chicago. His reports read like something out of a detective novel: private conversations with students in his hotel room where he would try to trick them into confessing, lurking around town to hear what talk he could of the publication, etc. The Pinkerton agent remained in Bloomington for nearly two weeks, dutifully reporting back each day, but it was the work of wagging tongues that revealed the authors and not so much J.H.S.’ fine detective work. As President Jordan suspected from the beginning due to the content and tone of the bogus, it was seven members of Beta Theta Pi fraternity who authored it. At the last moment, some of the writers lost their nerve and hid the newsletter in a trunk. The others, however, retrieved the bogus and distributed copies throughout the town. Many in the guilty party were from prominent families, including Nicholas Robertson, son of IU Trustee Robert Stoddart Robertson. Nonetheless, all seven were expelled from the University. Connections, however, had its benefits, of course. In June 1892, the faculty relented and degrees were granted to five of the men, and all seven were reinstated into the University with good standing. Below you can read the first letter of the Pinkerton operative — click the image for the full PDF of the letter, and if you’d like to read more, contact the Archives! What? You want to read the bogus that created such a stir? Well, be warned that it really is quite vile. But here you go – click on the bogus image to open a larger version, which you can then blow up for full reading pleasure.